Dr. Milner is well published with texts, medical journal articles and studies in cardiology, endocrinology, pulmonology, oncology, and environmental medicine. Dr. Milner calls his practice “integrated endocrinology” balancing all the endocrine hormones using bio-identical hormone replacement and amino acid neurotransmitter precursors. Dr. Milner’s articles include treatment protocols for hypothyroidism, ”Hypothyroidism: Optimizing Medication with Slow-Release Compounded Thyroid Replacement” was published in the peer review journal of compounding pharmacists, International Journal of Pharmaceutical Compounding. Half life — How long does it take a drug to bring blood levels to normal levels? Emotional attachment to disease — fixation and complaining without making changes. Dr. Leonard Wartofsky is Professor of Medicine, Georgetown University School of Medicine and Chairman Emeritus, Department of Medicine, MedStar Washington Hospital Center. He trained in internal medicine at Barnes Hospital, Washington University and in endocrinology with Dr. Sidney Ingbar, Harvard University Service, Thorndike Memorial Laboratory, Boston. Dr. Wartofsky is past President of both the American Thyroid Association and The Endocrine Society. He is the editor of books on thyroid cancer for both physicians and for patients, and thyroid cancer is his primary clinical focus. He is the author or coauthor of over 350 articles and book chapters in the medical literature, is recent past Editor-in-Chief of the Journal of Clinical Endocrinology & Metabolism, and is the current Editor-in-Chief of Endocrine Reviews. Bioavailability versus content of a thyroid replacement tablet, and how it is absorbed. When is replacement thyroid replacement hormone necessary? The danger of taking generic T4; are cheaper, larger profit margin, but the content varies. 1.39 is a healthy TSH level for women in the U.S. Symptoms of hypothyroidism, such as a slow mind, poor memory, dry skin, brittle hair, slow heart rate, problems with pregnancy, miscarriage, and hypertension. T4 is the most prescribed drug in the U.S.
Jonas de Souza participates in both clinical and outcomes research studies on malignancies of the upper aerodigestive tract, especially head and neck cancers. His research focuses on the use of novel therapeutic agents along with measurements of financial burden, patients’ preferences, and the trade-offs between the risks and benefits of cancer therapies. His research has sought to integrate outcomes research, patient preferences, health policy, and economics into clinical practice. His ultimate goal is to increase access to essential cancer therapies by providing policy makers and scientific communities with the required information on patient preferences and on barriers that lie between cancer patients and access to care. De Souza earned his MD from the University of Rio de Janeiro State. He completed his residency specializing in internal medicine at the University of Texas Health Science Center in 2008 and a fellowship focusing on hematology/oncology at the University of Chicago in 2011. “Financial toxicity,” or the financial burdens that some patients suffer as a result of the cost of their treatments can cause damage to their physical and emotional well-being. Lost income or high out-of-pocket costs for treatment, medication or related care. Like any other side effect, financial toxicity should be disclosed and discussed with the patients. Victor J. Bernet, MD, is Chair of the Endocrinology Division at the Mayo Clinic in Jacksonville, Florida and is an Associate Professor in the Mayo Clinic College of Medicine. Dr. Bernet served 21+ years in the Army Medical Corps retiring as a Colonel. He served as Consultant in Endocrinology to the Army Surgeon General, Program Director for the National Capitol Consortium Endocrinology Fellowship and as an Associate Professor of Medicine at the Uniformed Services University of Health Sciences. Dr. Bernet has received numerous military awards, was awarded the “A” Proficiency Designator for professional excellence by the Army Surgeon General and the Peter Forsham Award for Academic Excellence by the Tri-Service Endocrine Society. Dr. Bernet graduated from the Virginia Military Institute and the University of Virginia School of Medicine. Dr. Bernet completed residency at Tripler Army Medical Center and his endocrinology fellowship at Walter Reed Army Medical Center. Dr. Bernet’s research interests include: improved diagnostics for thyroid cancer, thyroidectomy related hypocalcemia, thyroid hormone content within supplements as well as management of patient’s with thyroid cancer. He is the current Secretary and CEO of the American Thyroid Association. In this episode Dr. Bernet describes that Hashimoto’s thyroiditis is an autoimmune condition that usually progresses slowly and often leads to low thyroid hormone levels — a condition called hypothyroidism. The best therapy for Hashimoto’s thyroiditis is to normalize thyroid hormone levels with medication. A balanced diet and other healthy lifestyle choices may help when you have Hashimoto’s, but a specific diet alone is unlikely to reverse the changes caused by the disease. Hashimoto’s thyroiditis develops when your body’s immune system mistakenly attacks your thyroid. It’s not clear why this happens. Some research seems to indicate that a virus or bacterium might trigger the immune response. It’s possible that a genetic predisposition also may be involved in the development of this autoimmune disorder. A chronic condition that develops over time, Hashimoto’s thyroiditis damages the thyroid and eventually can cause hypothyroidism. That means your thyroid no longer produces enough of the hormones it usually makes. If that happens, it can lead to symptoms such as fatigue, sluggishness, constipation, unexplained weight gain, increased sensitivity to cold, joint pain or stiffness, and muscle weakness. If you have symptoms of hypothyroidism, the most effective way to control them is to take a hormone replacement. That typically involves daily use of a synthetic thyroid hormone called levothyroxine that you take as an oral medication. It is identical to thyroxine, the natural version of a hormone made by your thyroid gland. The medication restores your hormone levels to normal and eliminates hypothyroidism symptoms. You may hear about products that contain a form of thyroid hormones derived from animals. They often are marketed as being natural. Because they are from animals, however, they aren’t natural to the human body, and they potentially can cause health problems. The American Thyroid Association’s hypothyroidism guidelines recommend against using these products as a first-line treatment for hypothyroidism. Although hormone replacement therapy is effective at controlling symptoms of Hashimoto’s thyroiditis, it is not a cure. You need to keep taking the medication to keep symptoms at bay. Treatment is usually lifelong. To make sure you get the right amount of hormone replacement for your body, you must have your hormone levels checked with a blood test once or twice a year. If symptoms linger despite hormone replacement therapy, you may need to have the dose of medication you take each day adjusted. If symptoms persist despite evidence of adequate hormone replacement therapy, it’s possible those symptoms could be a result of something other than Hashimoto’s thyroiditis. Talk to your health care provider about any bothersome symptoms you have while taking hormone replacement therapy. Jody Gelb is a Broadway singer and actress. Six months ago she was diagnosed with papillary thyroid cancer, during a doctor's visit for an unrelated issue. This news sparked immediate research and discovering an alternate path that does not include surgery. Antonio Bianco, MD, is the Charles Arthur Weaver Professor of Cancer Research in the Department of Internal Medicine. He is the president of Rush University Medical Group and vice dean for clinical affairs in Rush Medical College. Bianco came to Rush from the University of Miami Health System, where he served as professor of medicine and chief of the Division of Endocrinology, Diabetes and Metabolism. 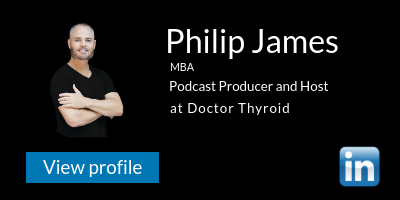 He has more than 30 years of experience in the thyroid field. He has been recognized with a number of national and international awards and membership in prestigious medical societies. A well-rounded investigator in the field of thyroid disease, Bianco led two American Thyroid Association task forces: one charged with drafting guidelines for thyroid research (as chair) and another responsible for developing guidelines for the treatment of hypothyroidism (co-chair). Bianco’s research interests include the cellular and molecular physiology of the enzymes that control thyroid hormone action (the iodothyronine deiodinases). He has contributed approximately 250 papers, book chapters and review articles in this field, and has lectured extensively both nationally and internationally. Recently, he has focused on aspects of the deiodination pathway that interfere with treatment of hypothyroid patients, a disease that affects more than 10 million Americans. He directs an NIH-funded research laboratory where he has mentored almost 40 graduate students and postdoctoral fellows. Thyroid produces thyroxin of T4. Nearly 5% of the U.S. population takes T4 or Levothyroxine, as revealed by the NHANE survey. This means 10 – 15 million Americans. Levothyroxine is the most prescribed drug in the U.S. Emotional roller coaster of feeling optimistic and other days of sadness.